David Lickley’s Wonders of the Arctic centers on the efforts of scientists to study and understand the Canadian Arctic environment and its wildlife – on land, in the air, and under the sea – even as climate change is triggering great changes in the region. Narrated by actor Victor Garber, the film is a little more dry than some of the others recently released on 4K UHD format by Shout! Factory, even at its scant running time of 42 minutes. Still, it features breathtaking large-format landscape and wildlife photography. It also offers interesting insights into the lives of Inuit tribes in the region. Of particular interest is a segment set in the tiny village of Churchill, Manitoba on Halloween night, as local wildlife officials post lookouts around the edges of town to ensure that trick-or-treaters are in no danger from the dozens of polar bears that live in the area. As with Shout! 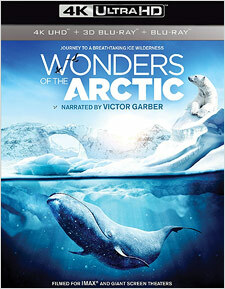 Factory’s other 4K IMAX releases, Wonders of the Arctic is a 2-disc set. The first is a 4K Ultra HD Blu-ray disc that includes two versions of the film in 4K – one with HDR and one without. The film appears to have been shot both digitally at 4K and 8K resolutions, and on 35mm and 65mm film (the latter used for aerial shots – the 35mm was scanned to 6K and the 65mm to 8K for post production). The film was finalized in 5.6K resolution and the result was then scanned out to 70mm for IMAX projection. Interestingly, this presentation appears to have been scanned from 70mm film, as the occasional bit of dust or nick on the film element is visible. Either that, or the some of the original film footage wasn’t given a digital clean-up pass before editing. In any case, the film is presented at the 1.78:1 aspect ratio. Overall image clarity and detail are excellent at all times. Given the film’s bleak setting, colors often tend to involve subtle shadings of blue, white, and gray, at which point the format’s 10-bit color struggles a little bit to distinguish the various shades, resulting in a tiny bit of fluttering color banding. Still, when vibrant colors are apparent they pop off the screen with HDR. The film’s soundtrack is included in a solid and atmospheric English Dolby Atmos mix that doesn’t exactly dazzle, but certainly immerses the viewer in the visuals. Additional audio is available in French 5.1 DTS-HD Master Audio format, and there are optional English captions. Extras on the 4K disc are scant. There’s a corporate video for Fednav, a shipping company that sponsored the film (in upconverted HD – 2:27), as well as 4K trailers for The Last Reef, Wonders of the Arctic, Rocky Mountain Express, Journey to Space, Flight of the Butterflies, and Humpback Whales, all of which are now available on 4K UHD Blu-ray format from Shout (click on the title links to read our reviews of each). 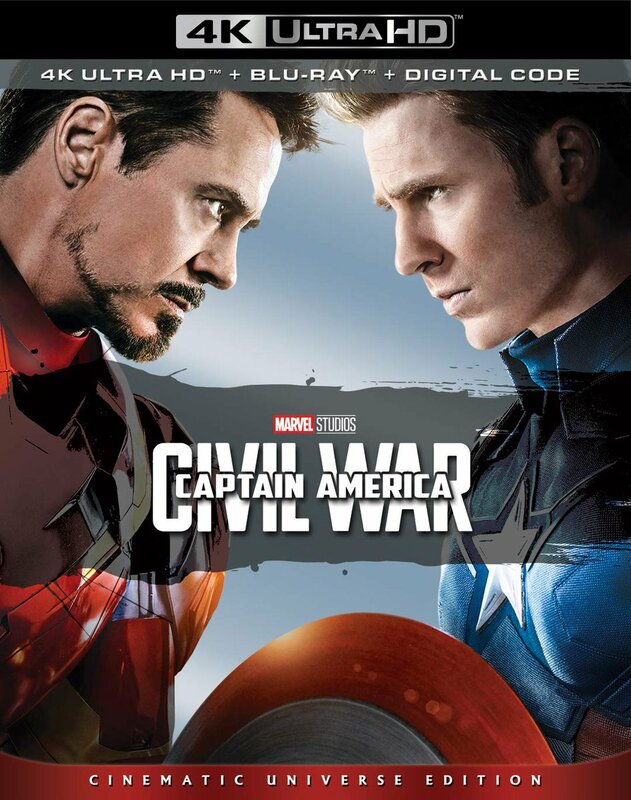 The second disc in this package is a Blu-ray that includes the film in high-definition in both 2D and 3D versions. The quality of each presentation is very good, as you would expect given the source material. The 3D delivers good depth and dimensionality, though the effect can sometimes seem a little exaggerated due to the lack of subjects in the frame – often you simply have a person or a few objects in the foreground moving against a vast and distant landscape on the horizon. Note that there’s also a code for a digital download version. Though not quite as engrossing as other IMAX titles on 4K Ultra HD, Wonders of the Arctic is certainly an interesting documentary and it looks and sounds great in both HD and 4K. This disc is well worth a look, though you might consider trying of few of Shout! Factory’s other recent 4K/IMAX documentary releases first.